At age 17 Alysa Giudici has taken home a lot of hardware from her competitions. Her nearly 200 awards include two AAU National titles, two AAU Junior Olympic titles, a Silver medal at the WKO North American Cup, and a gold medal at the WKO world championship. She is a motivated karateka who has the rare ability to win in Kata (forms), Kumite (sparring) and Kobudo (weapons). Alysa has been training with Shotokan traditionalist Sensei Scot Demarest from Michigan since age 6. Alysa is known for her fast and powerful kicking and her fluid and focused kata. We brought Sempai Giudici on as a Brand Ambassador because of her incredible focus and maturity. Her appearance on our podcast, Martial Arts Radio, generated a lot of positive feedback. We're honored to count her as part of our family. 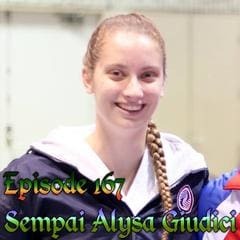 You can listen to Sempai Alysa Giudici in her Martial Arts Radio interview and find her on Instagram.